Liam Pitchford told his mother “I want to do this full-time; I don’t want to go to school anymore”. He practiced 4 nights/week and now he is one of the best European table tennis players. He is a thin guy, with average physical strength. But what makes Liam be the top player? He is 2016 World Championships – Men’s Team Bronze Medalist, and 2016 Olympics hope for England. And what is his equipment? 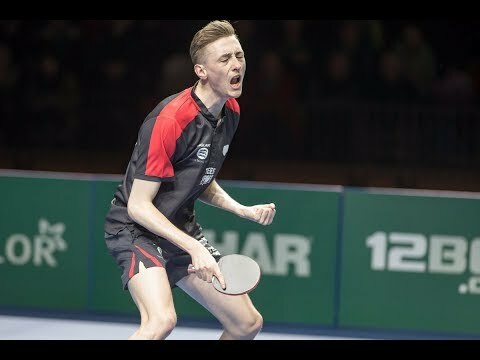 Liam Pitchford quickly climbs up to the top 20 table tennis player in the World Ranking. His winning percentage is rather good, about 62% of winning percent! So what is his specialty? Learn table tennis from the new level to the master level. The new level starts from the body, the arm, the elbow. And the master level is playing with your fingers. Liam has played with his fingers very soon. He has a wonderful feeling and a very good acceleration with his wrist. That’s why he has one of the best backhands in the world. China Team has to change the tactic when Fan Zhendong played versus Liam Pitchford. They want to avoid backhand to backhand exchange with Liam. They change the playing direction to Forehand-to-Forehand looping game. I took the Olympic champion quite close and had him worried at one point. Actually, Liam Pitchford is sponsored by Butterfly. His equipment is Mizutani Jun ZLC (blade), and Tenergy 05 Red (forehand rubber) and another Tenergy 05 Black as a backhand rubber. Liam has a flexible and fast wrist. That’s why he is using Viscaria blade. Thank you coach.